Does it matter that no-one reports on Parliament anymore? Has Parliament completely lost its role as the national debating chamber? And did opening it up to broadcast media hasten the decline? Apart from the Queen’s Speech, the Budget, PMQs, occasional set-piece such debates about going to war, and celebrity appearances before Select Committees, the House of Commons (let alone the Lords) is barely covered by mainstream newspapers or broadcast media. Almost all of the media content featuring MPs or peers is garnered by journalists themselves in press conferences, studios and staged interactions or informal assignations. Aficionados of pure Parliamentary process have only BBC Radio 4’s late night Today In Parliament and Hansard Online. Does it matter that you are more likely to hear a MP giving a soundbite while wearing a hard hat on a factory floor at some carefully orchestrated photo opportunity rather than speaking from the green benches of parliament? 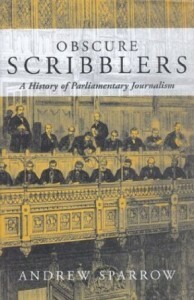 I’ve been re-reading Obscure Scribblers by the Guardian’s Andrew Sparrow. Andrew himself represents the change in political journalism, having been transformed from a traditional Parliament Press Gallery correspondent to the Guardian’s political live blogger. 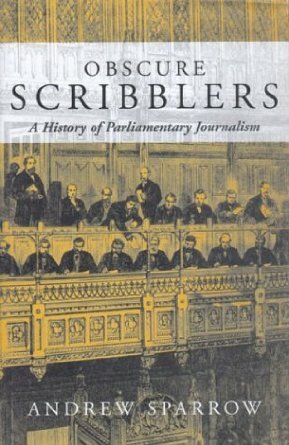 Written in 2003 at the height of New Labour, Obscure Scribblers is a detailed and fascinating history of how the hacks fought for centuries for the right to report on the Mother of Parliaments. Sparrow describes the battle to be able to sit in on debates up to the late 80s when the newly-minted 24 hour Sky News channel used it as a source of cheap live content. Yet with the Thatcher and Blair years the professionalization of political communication meant the soap-opera of spin replaced the theatre of Parliament and the press. By the time Sparrow’s book came out what went on in the two chambers was largely ignored. There is plenty of political coverage by the Lobby and other political journalists of Westminster politics, but parliamentary proceedings are no longer reported in any detail. 70 years on and it is clear that allowing radio and TV into the chamber has had little success in halting the tide of indifference. Sparrow’s book gives lots of good reasons. Political reporting became less deferential. Parliament is deathly dull and concerned with legislative process, not the kind of lively argument seen on popular political programmes like BBC’s Question Time. There is much political reporting about issues and process but it is not based on what is said in the two Houses. So will social media solve the problem set out by Churchill? What kind of political journalism will foster engagement and enlightening debate? How can politicians get attention for their daily work? Any number of MPs tweeting from the green benches will not make much difference – though it can’t do any harm. We have more political blogs, fact checking websites and debating forums than ever before. From Comment is Free to Mumsnet there are thousands of places where people talk politics and where politicians might even get a hearing. The difference now is that if they want to be part of the conversation they must leave Parliament in every sense. So in answer to my original question? No, it probably doesn’t matter at all. I agree with Andrew’s tweet (below), that overall parliament is covered better thanks to social media, though the coverage of debates is still negligible. See also the comment to this article by political blogger, Paul Staines aka ‘Guido Fawkes’. Hi Charlie – are you sure this isn’t just the natural evolution of things when the newsmedia machine has moved towards infotainment, including lively debates and soundbite collection? In other words…is there any other way for a journalist to be read/listened/seen/followed by an audience apart from by making sure the “news” are first and foremost entertaining, iow mostly empty of substance? We have hired Simon Carr as a sketch writer. I think we now report parliamentary proceedings more than any broadsheet or tabloid. We cover select committees as well as PMQs and the like.